First Round playoff tickets on sale Monday, April 8 at 10 a.m. Individual game tickets for the first two (2) home games of the Stanley Cup Playoffs First Round will go on sale on Monday, April 8 at 10 a.m. Tickets for future First Round games, if necessary, will be made available once games are confirmed. At this time, opponent and exact game dates and times have yet to be confirmed. Full details on the First Round schedule will be released by the NHL on Sunday, April 7. Please refer to winnipegjets.com for the most current updates. Individual tickets range from $161 to $444 per game (inclusive of facility fee, service charge and GST) and can be purchased online at winnipegjets.com/tickets. There is a strict limit of four (4) tickets per person for each game. It is anticipated that the limited inventory of tickets for First Round games will sell quickly. Fans are encouraged to visit winnipegjets.com/tickets/tips-and-tricks for help on safely navigating attempts to purchase Winnipeg Jets playoff tickets. Those who are unable to secure tickets can frequently visit Winnipeg Jets SeatExchange where additional tickets may be posted at any time. Fans are reminded that winnipegjets.com/tickets and winnipegjets.com/seatexchange are the only authorized sellers of Winnipeg Jets tickets. Going directly to these sites is the best policy as all other websites represent unauthorized sellers where buyers run the risk of purchasing fraudulent and overpriced tickets. Tickets for the first two (2) home games of the First Round 2019 #WPGWhiteout Street Parties presented by Tim Hortons will go on sale on Monday, April 8 at noon. Tickets for future First Round games, if necessary, will be made available once games are confirmed. Individual tickets are $5 each (with no additional fees) and can be purchased online at winnipegjets.com/tickets. There is a limit of four (4) tickets per person for each game. All Street Party ticket proceeds will be distributed to local agencies making investments in the community through United Way Winnipeg around three key themes: addiction, homelessness, and mental health. For more information, please visit wpgwhiteoutstreetparty.ca/giving-back. For more information and general FAQs regarding the 2019 #WPGWhiteout Street Parties presented by Tim Hortons, please visit wpgwhiteoutstreetparty.ca/faqs. 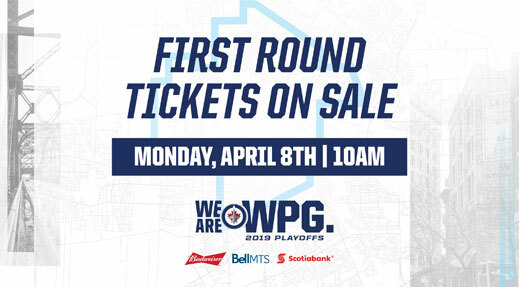 First Round 2019 #WPGWhiteout Viewing Party tickets on sale Monday, April 8 at 2 p.m.
Tickets for the first two (2) First Round away game #WPGWhiteout Viewing Parties will go on sale Monday, April 8 at 2 p.m. Tickets for future First Round Viewing Parties, if necessary, will be made available once games are confirmed. Individual tickets are $10 each (inclusive of facility fee, service charge and GST) and can be purchased online at winnipegjets.com/tickets. There is a limit of eight (8) tickets per person for each game. Tickets are reserved and include a We are WPG rally towel. Net ticket proceeds will benefit the True North Youth Foundation, the charitable arm of the Winnipeg Jets and Manitoba Moose. For more information on the #WPGWhiteout Viewing Parties, please visit winnipegjets.com/viewingparty. Tickets for all Winnipeg Jets playoff games, #WPGWhiteout Street Parties, and #WPGWhiteout Viewing Parties are digital and patrons will need to use their smart phones to enter Bell MTS Place and the Street Parties. Bell MTS Place and True North Sports + Entertainment do not offer print-at-home PDFs as an entry option. To simplify this process, patrons are encouraged to download the Ticketmaster App to their smart phones and log in to their Ticketmaster account using the same credentials used to purchase their tickets. For FAQs and further assistance from Ticketmaster, please visit ticketmaster.ca/help. Tickets for all Winnipeg Jets playoff events are available at winnipegjets.com/tickets.